Let me offer a local example to illustrate a problem that is relevant in every city and town in Rhode Island and probably across most of the country. Tiverton’s budget committee (of which I’m a member) has no final authority over anything. Zero. The committee’s sole power is to define “the town’s” budget at our annual financial town referendum. The town council can put in a different budget. The school committee can put in a different budget. And any registered voter in town can put in a different budget (with 50 signatures). I’ve submitted the budgets that voters have chosen in all of the past three years. The school committee, by contrast, has final authority over around 60% of the town’s $50 million budget. It is responsible for the education of most of the town’s children, it negotiates the town’s biggest labor union contract, and it generally has control of the larger part of the town’s real estate holdings. Nearly a third of the Tiverton High School senior class is at risk of not graduating in June because of failing grades and low attendance. There’s also an uptick in emotional issues, according to administrators and staff. In any event, the school department has had an average surplus of almost a million dollars per year for the last five and, as of last June, was sitting on a $3.5 million reserve fund. From personal experience, I can testify that taxing for that money puts strain on local families, which can contribute to financial difficulty and familial stress. My core point with this post, though, is the public response to government. The local newspapers have been awash with letters to the editor recently (most from members of a particular elementary school’s PTO), and what do you suppose their focus has been? Not a single one has been about the performance of our school district. Rather, their focus is entirely the budget committee, mostly concerning whether or not its meetings start with three-minute free-for-all public commentary and attacking members for being insufficiently deferential to department heads. Who is leading these parents to target a mostly inconsequential committee and to what extent is that a deliberate effort by paid insiders to distract from their own failures? Obviously, it’s much easier to demand more of other people’s money than to force accountability from the teachers, administrators, and elected officials who have the town’s children under their thumbs. How many other examples are there throughout Rhode Island? Lots. Uninformed parents are easily led, and some are even more motivated to act out if they can blame someone else for their child’s challenges. There will always be a small minority of irrational true believers–no amount of facts or logic will change their opinions. The real question is how do you inform the rational, uninformed majority? How do you let facts and logic lead them to know the real problem isn’t money, but a new curriculum and opportunism (never let a crisis go to waste) by, perhaps, the School Superintendent? How do you put a spine in a Town Council that folds when less than 1% of a town’s population shows up and advocates for their own benefit and the Council folds like a wet Taco? Have you engaged someone in the Press who has the ability to get to the root of this challenge? These parents have been attending all the meetings or watching the live feeds. They are far from uninformed. If anything sir the first time people are paying attention to what’s going on, and they don’t like what they’re seeing. That’s why they’ve been attending. It’s a wonderful sight to see. Unfortunately they don’t like seeing a budget committee who continually goes off track with their own opinions on how things should be run. They don’t like a budget committee that attacks tax payers who speak, only to have their comments removed from public record. They don’t like tax payers being silenced by taking away their right to speak. Mr Katz’s blog as always in one sided and bias. No surprise there. How dare anyone challenge them. So activism makes people informed? Or are uninformed people often activists? What of the issues Mr. Katz speaks? Is it really $ that are driving the challenges the school faces or is it the curriculum? Do you have a bias? Please educate us. So people who attend meetings so they can be informed are activist. People aren’t capable of educating themselves by attending the meetings? I know for a fact it’s a lot more than parents from an elementary school. As usual Mr Katz gets the issue confused. No I have no bias. I’m sure he’d say differently though. What if the budget committee silencing taxpayers? Please educate us. You lost me “I have no bias.” We all have biases…if you don’t think you do you are incredibly unaware at best Moreover, if you can’t state then facts and or even identify the issues you are not credible and are wasting everyone’s time. For example, you claim Mr. Katz is confused. That is your opinion and you have right to it. However, to be convincing and credible, you should support your opinion with facts and analysis. Some logic/reason. Mr. Katz does this…you should try it. Wrong yet again–and then you follow with the classic defensive–and childish– emotional outburst, proving to all you have little but opinion backed by bias and ignorance. Thank you for proving Mr. Katz’s point. Thanks for your opinion once again. Along with your typical superior attitude that is so incredibly cliche. Thanks for showing exactly what Tiverton taxpayers are sick of. No Accountability = Arrogant public officials and second rate schools. Trite slogans = lack of information and critical thought. 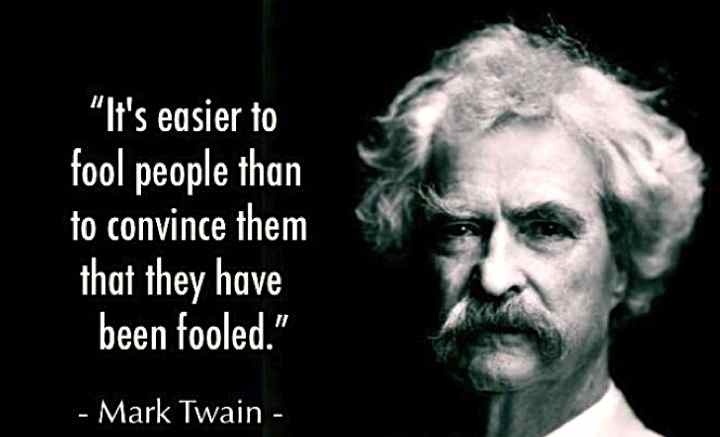 The Mark Twain quote is good, though perhaps not well thought out. Mr. Katz seems to think are being fooled and is trying to convince you of the fact, no? So, what does that infer?